Metropolitan weddings in India are fast emerging as glamorous events with great respects for Indian traditions and rituals. These are the grand affairs celebrated with all the modern amenities and elegantly decorated sparkling venues. From wedding dresses to dinning and wedding cars everything has a definite reflection of modernity. Although all the rituals are being followed even today but its symbols have certain dint of new era. 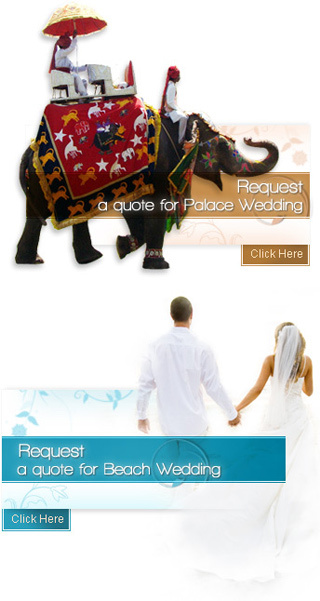 The Indian metropolitan weddings have come of ages. Metropolitan weddings in India are best identified with a seamless blend of glamour and great respect for Indian traditions. Indian Weddings are considered most auspicious moments of an individual's life as it is a union of two bodies, hearts and souls. The second most populated country in the world, India is home to lakhs of villages, hundreds of cities and dozens of metropolitans. Countless number of weddings takes place round the year in country. The country with over a dozen of metropolitans and megalopolises presents a great specimen of harmonious blend of different cultures. These are the places where people of different religious and geographical backgrounds live together in complete harmony. Weddings in metropolitans are not new phenomena but the weddings celebrations have seen a sea change in recent times owing to large presence of means of communication and certain influence of media. India with a good number of metropolitans like New Delhi, kolkata, Chennai, Mumbai, Hyderabad, Bangalore, Pune and other metropolitans is witness to numerous metropolitan weddings in India. Every metropolitan has its own speciality when it comes to weddings. For example weddings in Delhi has certain influence of prevailing regional culture of land and all the services and amenities are designed to meet the popular practices of the region. Likewise, wedding custom and traditions in Kolkata and Mumbai differs a lot due to certain influence of the local culture. To make metropolitan weddings in India an easy affair the couples can also avail the services of professional wedding planners who are able to arrange every thing to make weddings in metropolitans an easy affair.